The Long Beach Aquarium of the Pacific debuted its Aquarium on Wheels during a recent visit at Hudson K-8 School. 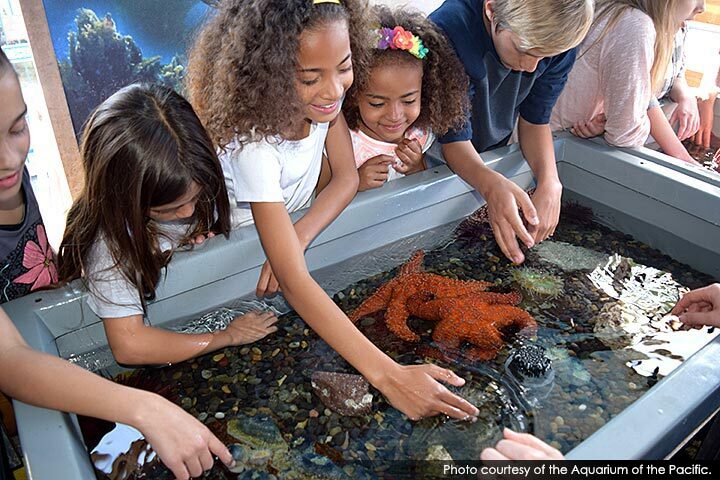 The mobile tide pool, housed in a 32-foot-long truck, gives children a chance to feel a spiny sea star, touch a slippery sea cucumber or experience the rough textured skin of a shark. The exhibit helps students develop an appreciation for the wonders of the ocean environment. The mobile aquarium is made possible by a $200,000 grant from the Tesoro Foundation. The goal is to reach more than 40,000 students, teachers and parents. The exhibit includes 10 different species of sea animals that students can touch. “My favorite part was to get to see the sea creatures, and getting to touch them and know facts about them,” Hudson student Angelo Rivunal said. Because the exhibit debuted at Hudson, the school hosted a dedication ceremony attended by Aquarium and Long Beach city officials, students and school staff. MOBILE AQUARIUM – The Aquarium of the Pacific recently debuted its Aquarium on Wheels. Housed in a 32-foot-long truck that visits schools, the exhibit allows students to see and touch several species of sea creatures.